My mother-in-law never runs dry of fun ideas for things to do with Laurel, and during a recent visit, she came up with a brilliant way to get my little homebody outside. She proposed a "penny walk" (apparently something she had learned at camp as a child), where you take a penny and at every corner, flip the coin to decide whether to go straight or take a turn (if at an intersection you could opt for left or right). 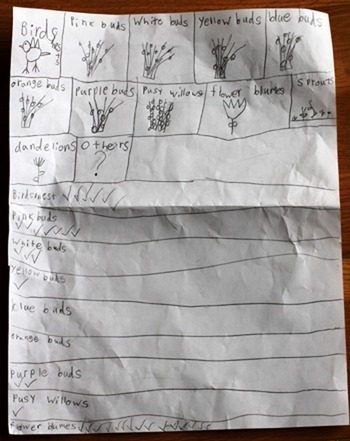 Laurel was so excited about this idea and before they departed, she decided to also turn the walk into a nature scavenger hunt and constructed the below tally chart (click image below to enlarge). It's a lovely activity when it's nice out, but also would be fun in the rain this week -- no doubt accompanied by a little puddle jumping. What a fun way to get your kids outside and also work in some lessons about nature observation, counting, and probability, no?